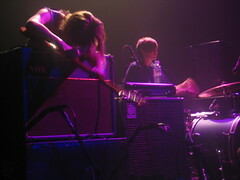 Because seeing Electrelane once is definetly not enough, I had to go catch them again at Irving Plaza last week. Here is Mia Clarke playing her guitar and amp and drummer Emma Gaze. There are way more photos on flickr and I think they turned out better than the Paris ones because I basically glued myself to the stage for the evening! This entry was posted in Indie Rock and tagged Uncategorized. Bookmark the permalink.